I was out on my day work duty when I came across a cute teddy bear that is completely Malaysian. Welcome to Songket Teddy Bears. 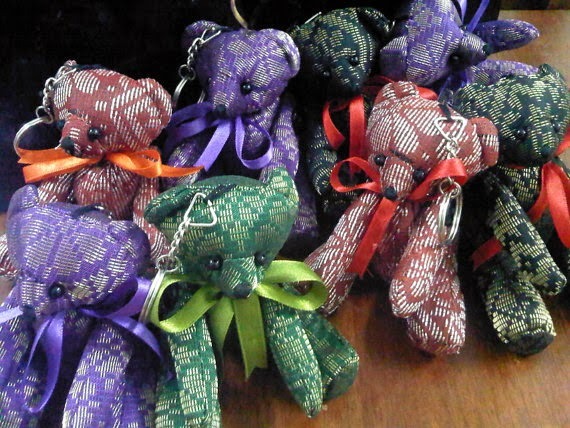 They are soo cute as a teddy bear should be but their dual role in promoting Malaysian handicrafts is cool indeed. Malaysian handicrafts are usually fixed in their mentality for example a songket (the material of which the bear is made of) is usually for traditional events such as the weddings for the Malay and usually reserved for other solemn occasions. The creation of songket teddy is vital to make songket more appealing to the global market. In this regard, Batik Kaftan Crafts will showcase a selection of Songket Teddies for all. Enjoy!